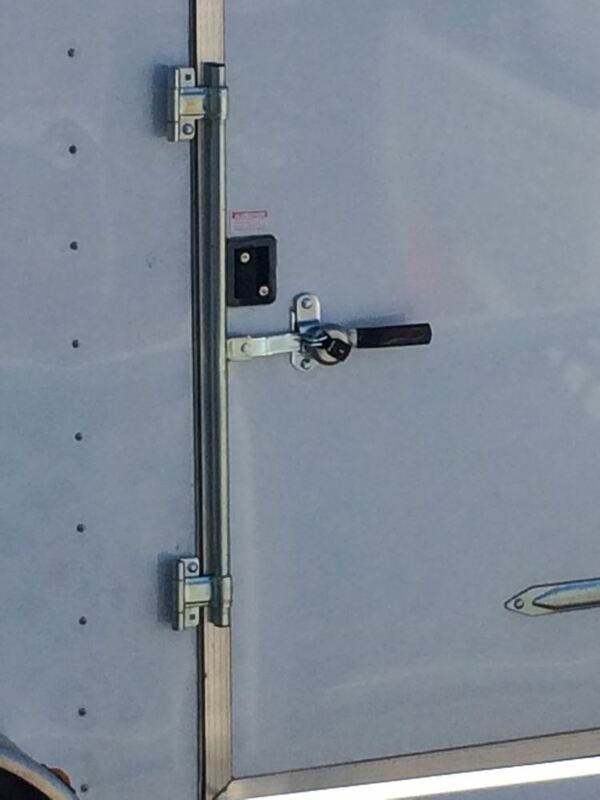 Cam-door style lock is ideal for use on trailer side doors that may be smaller than rear doors. Features 36" long pipe and rust- and corrosion-resistant zinc coating. 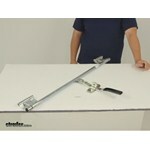 Call 800-298-8924 to order Polar Hardware enclosed trailer parts part number 305736 or order online at etrailer.com. Free expert support on all Polar Hardware products. 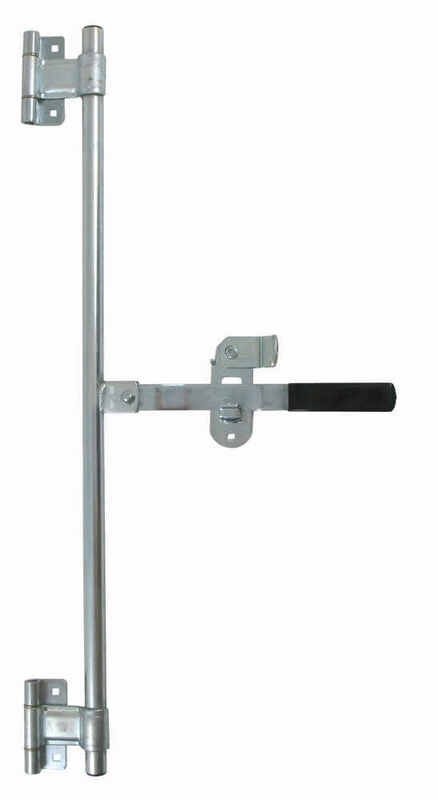 Guaranteed Lowest Price and Fastest Shipping for 36" Lock Side-Door Bar Lock Assembly. Enclosed Trailer Parts reviews from real customers. Product shown with lock (lock not included). 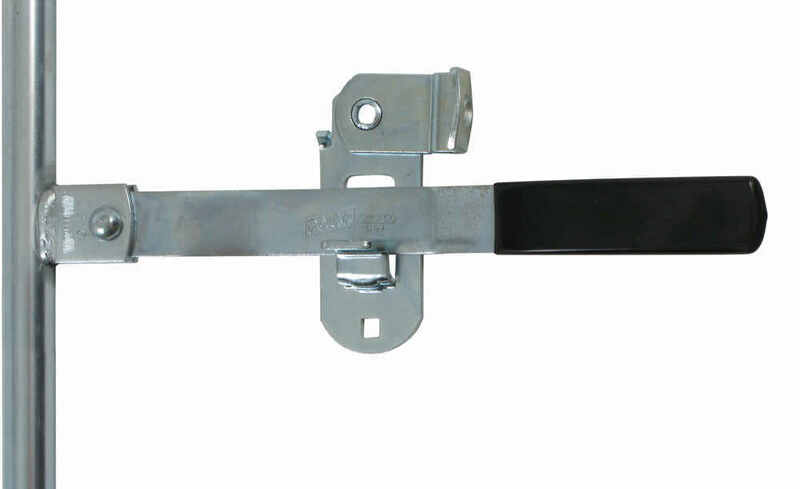 Steel anti-rack cam-action door latch is ideal for large trailers and can be installed flush on doors with a 3/4" offset. Pipe retainers allow the pipe to be positioned closer to the edge of your door. 3/4" Pipe not included. Today we'll be reviewing part number 305736. 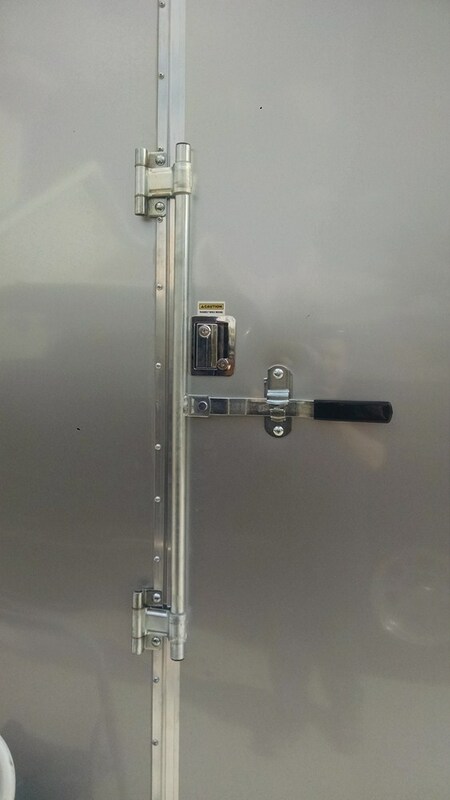 This the Red Line 36 inch Lock Side Door Bar Lock Assembly. We'll measure the overall length, you'll see that it is going to give us that 36 inch measurement. This system can be used on either the left or right hand side of the door. All you'd need to do is flip it around, and then you can still mount everything the same. No hardware is included, so keep that in mind, that you will need to purchase mounting hardware in order to get this set up correctly. 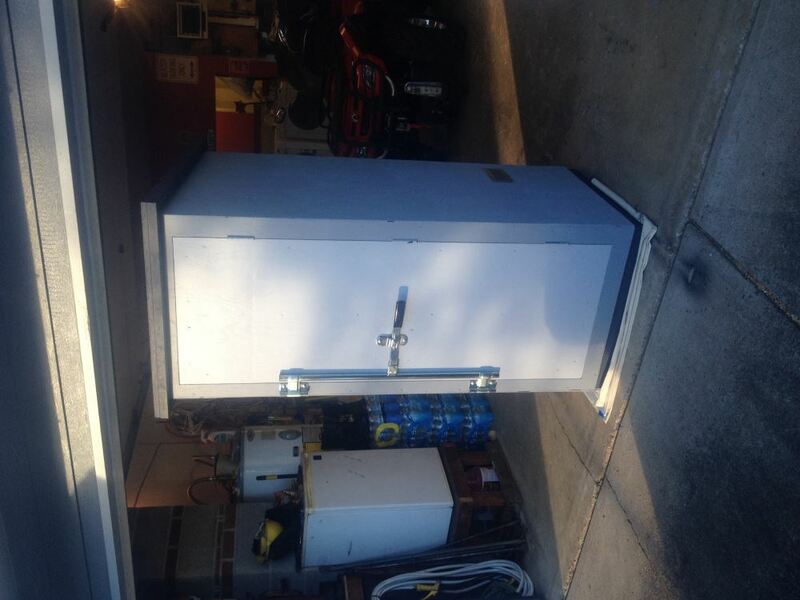 Everything that you see here is included--you're going to get the bar, the hinges are already on there, the handles are already on, and then you get everything that you need to mount to the door, to lock the handle in place. The only thing that you may need to purchase separately is an actual lock that goes through these holes here. 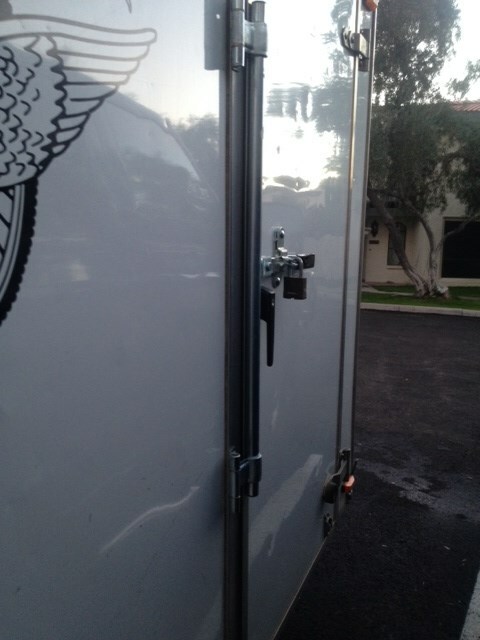 That way you can secure it and make sure that nobody can get inside the trailer or open up the door without the key for the lock. Let's go over a few measurements real quick. Between our two mounting holes on this side--it's going to give us a measurement of four inches. Then down here at the base--we're just going to go over the diameter of the hole, this is a square hole, so it's going to measure the same on each side, it's going to be 3/8 of an inch. And then the distance between these two mounting holes, center to center, is going to give us a measurement of 3 1/4 of an inch, and the diameter of the holes on the hinges are also going to measure 3/8 of an inch. That's going to be identical for both the bottom and the top, or the top and bottom. The distance that we have from the outermost holes, so bottom and top of the hinge, center to center, is going to give us a measurement of 34 and 3/4 of an inch, and then the inside holes, center to center, is going to give us a measurement of 28 1/4 of an inch. The ideal length from the bar to the center of the mount for the handle is going to need to be right around 6 inches. And then the width of that mount itself is going to measure right at 2 inches. So again, it's very easy to install. 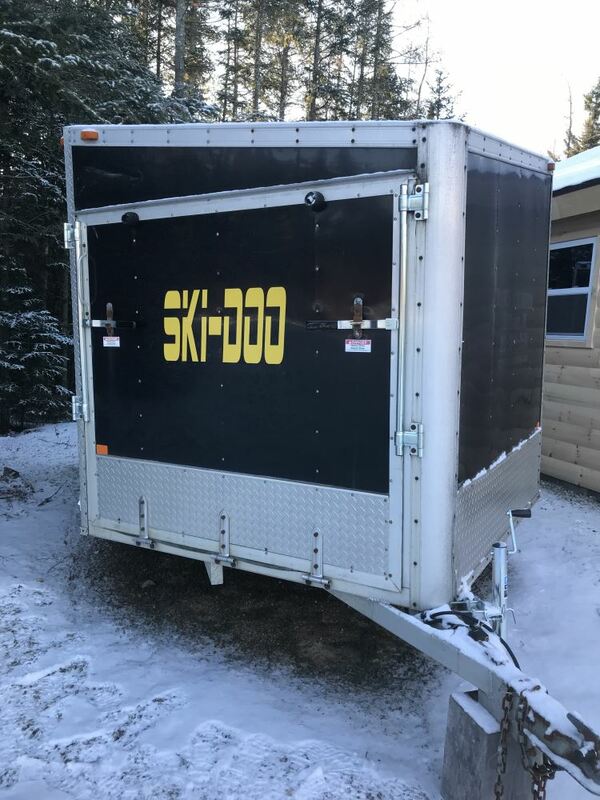 You just need to make sure you that you have nice, secure screw or bolt applications that you can mount directly into the trailer, or whatever you're mounting this to. You want to make sure you have a nice sturdy connection. Maybe directly into the frame, or a nice support. So you have two holes here on the hinge, two holes here at the hinge, and then you'll need to mount at this point here. This does mount on to a raised portion, or raised lip, so that way once you have it mounted, you'll be able to swivel that, and drop it, and then you can raise or lower the handle out of it's location, and open up the door, and then you can swing it back in place to lock everything up tight. The diameter of this bar is going to give us a measurement of right at 1 inch. And that's going to do it for today's review of part number 305736. 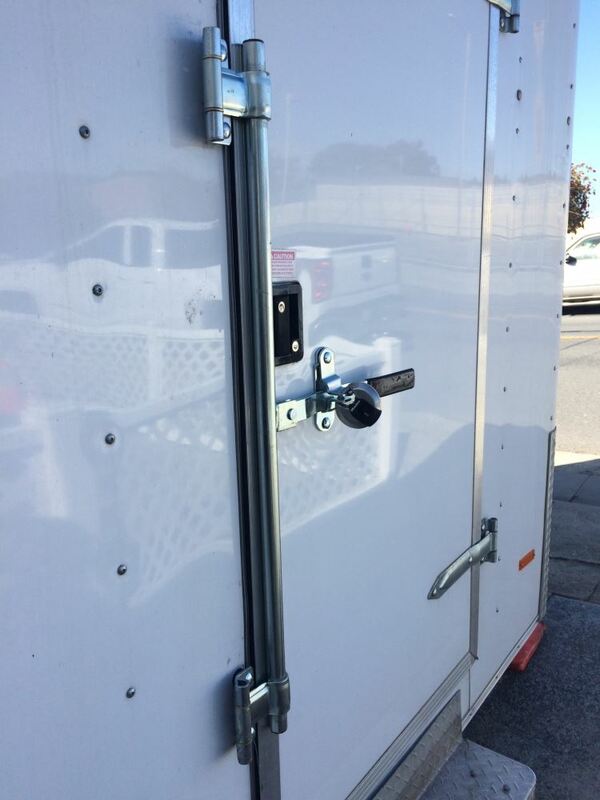 This is the Red Line 36 inch Lock Side Door Bar Lock Assembly.	.
Order: RelevanceNewestRating - High to LowRating - Low to High Cam-door style lock is ideal for use on trailer side doors that may be smaller than rear doors. Features 36" long pipe and rust- and corrosion-resistant zinc coating. This product still works great and looks like new! We will go to you first if we have any other needs. 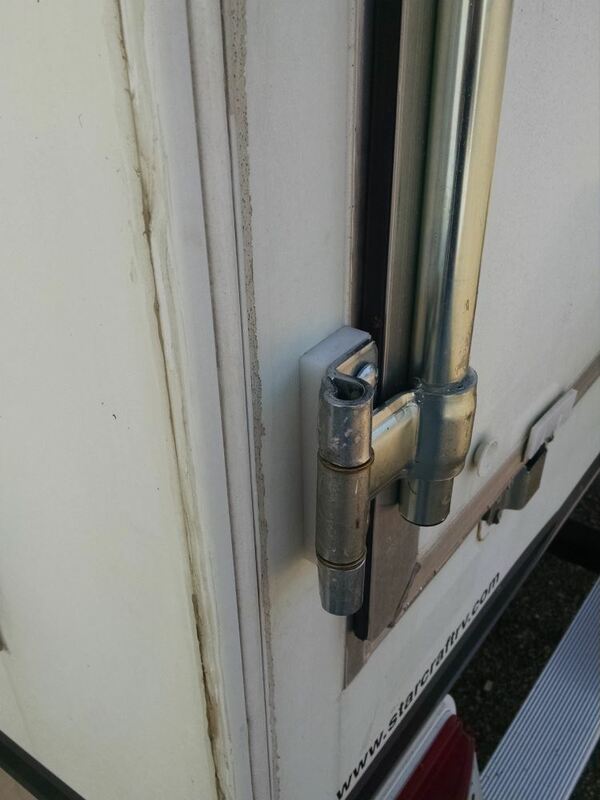 Steve,there is an aluminum trim around the rv door, I just bumped the hinge of the bar to the closest lip of that alum. trim to the door basically mounting over the top of the trim -so on top of the left side bump and bumped the right side if that makes sense. it kinda naturally fits. the bar lays nice and tight to the door by just mounting it ad is. 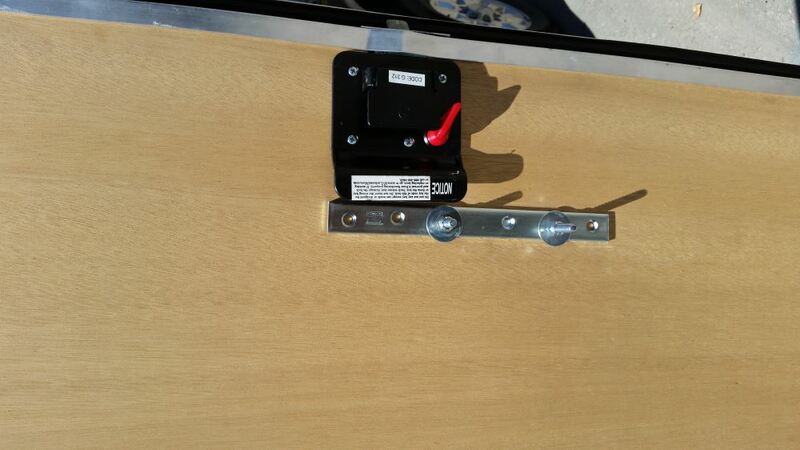 Add some metal straps on iside of door mount to beef that up. I used 2 or 2.5 inch bolts with oversized washers on inside alum. jamb and cut off excess bolt and grindedsanded smooth to nut. I siliconed the gaps on the outside above hinge because it wont sit flat due to the alum. trim so water doeant get on by bolts. Hope that helps. Thanks for coming back and following up! Working great. Would order from you again. Is there a weak point created when bolting the hinges so close to the edge of the door opening? Could you install one of these by moving the whole assembly to the left, thus creating room for hinge backplates? I guess you would have to lower the mount point as well, to avoid the doors backplate from hitting the factory lock and use a shorter but wider door backplate.I assume you feel your hinges are secure. I have yet to take ownership of my trailer so I dont know what kind of stud is framing the door.I am so happy this accessory is available. 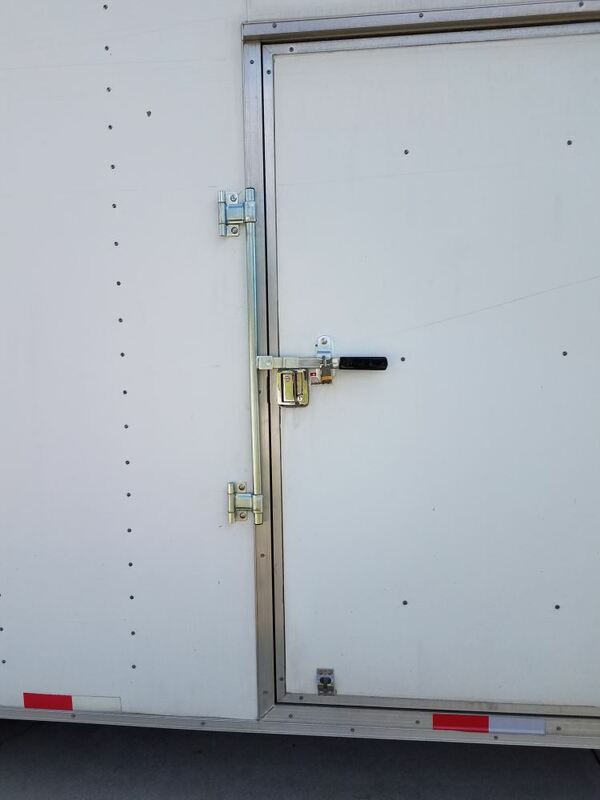 I really didnt notice the pitiful side door lock until after I purchased my trailer. A crowbar and about 5 seconds is all it would take to get inside! Usually these latches are not positioned so closely to the edge of the door. Most of the time, the hinges of the handle side and the latch for the handle are set equidistant from the edges of their respective doors. 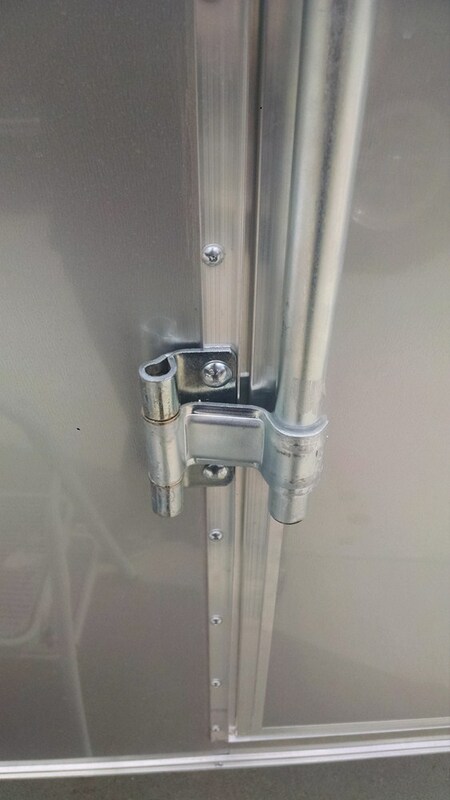 The latch assembly is exactly what I needed for the shed that I built to house my small refrigerator. The critters or other unwanted cant get in. Loved your product! Easy to install, great price, and arrived earlier then expected! Piece of mind now going down the road. That side door is NOT coming open! Ill be back! While doing on research on this product I contacted the manufacturer that assembles this product. They confirmed that yes, the Shim for Narrow Bracket Strap Hinge Stainless Steel # PLR2001-SS will work. It adds 1/8" shim for the 36" Lock Side-Door Bar Lock Assembly # 305736 bushing as well as 2000 series hinges. What type of latch do you have on your tack room door? If it is a cam door style lock like the Lock Side-Door Bar Lock Assembly part # 305736 then you can use something like the Global Link Vise Lock for Cam-Action Door Latch part # 295-000025. If this is not the type of latch you have on your tack room then please send me a photo and I would be happy to let you know if we have any options. 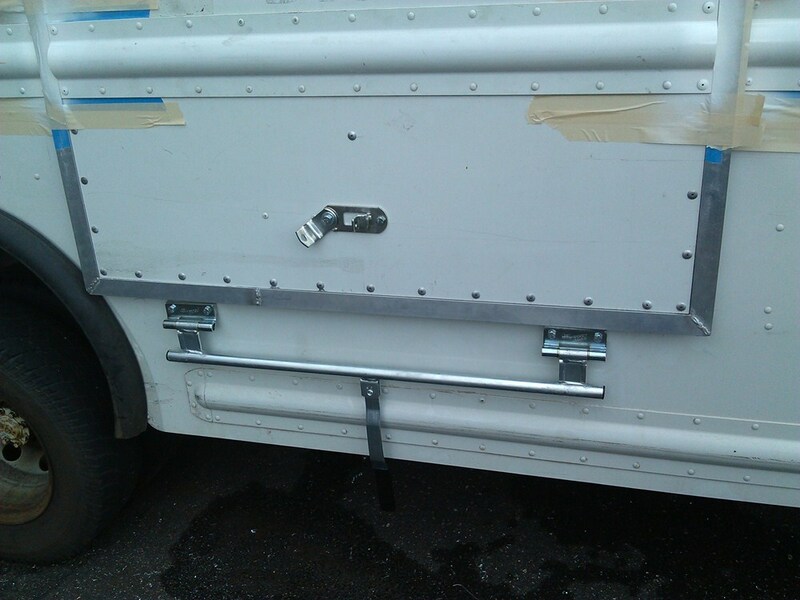 To install the 36 Inch Lock Side-Door Bar Lock Assembly # 305736 you will want to use carriage bolts, nuts, and washers. There is not a part number that includes this hardware for # 305736. 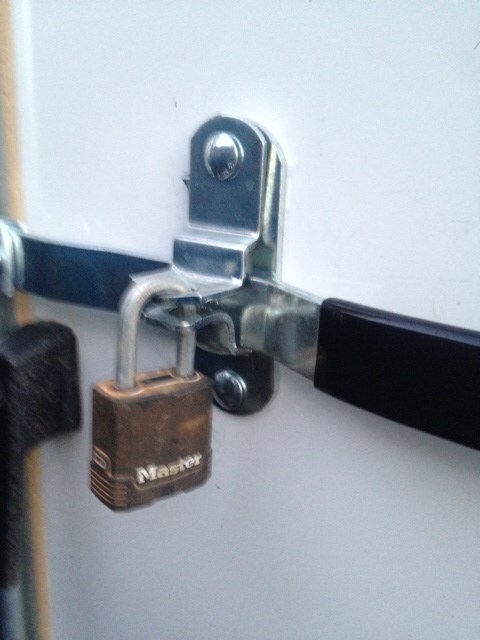 You will want to use 5/16 inch carriage bolts to secure the latch to the trailer. You can find these carriage bolts at your local hardware store. We do indeed have 55 inch bar locks, part # 3057-55. You can order them using the provided link. 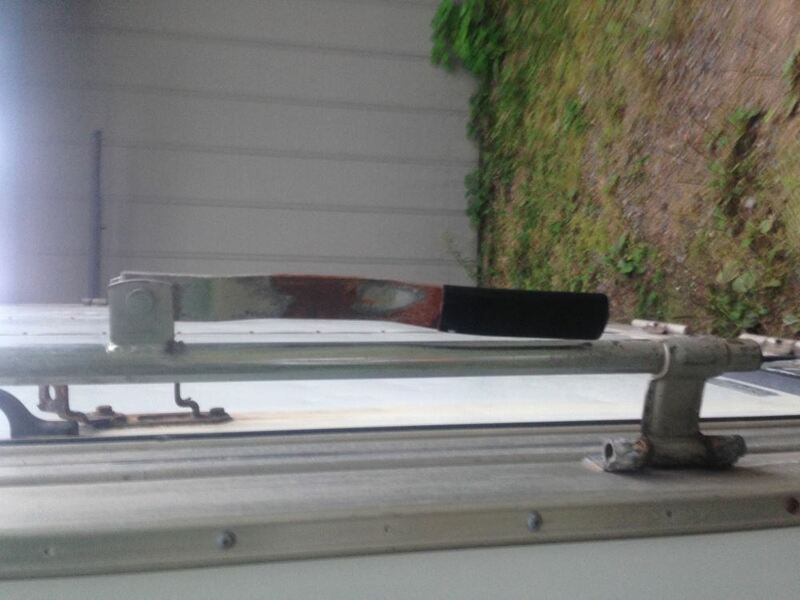 If you have a ramp style door that swings down and becomes a ramp what I recommend you do is purchase 2 separate 36 inch Lock Side-Door Bar Lock Assemblies, part # 305736, and mount one on either side of your door. This way you will get a handle and hinge on either side of the door like you want. If you need the whole assembly and it is a cam-style door then # 305736 is a good option. I have linked a video for you. We have some other handles depending on what you need. I have included a link to them for you. If you just need the handle that for a cam door then use # 158-100. What you could do is use the universal cam-door lock # 383200. You can then get a bar with the proper offset needed to work with your trailer door. I have included a link to a video review of this product for you to view. 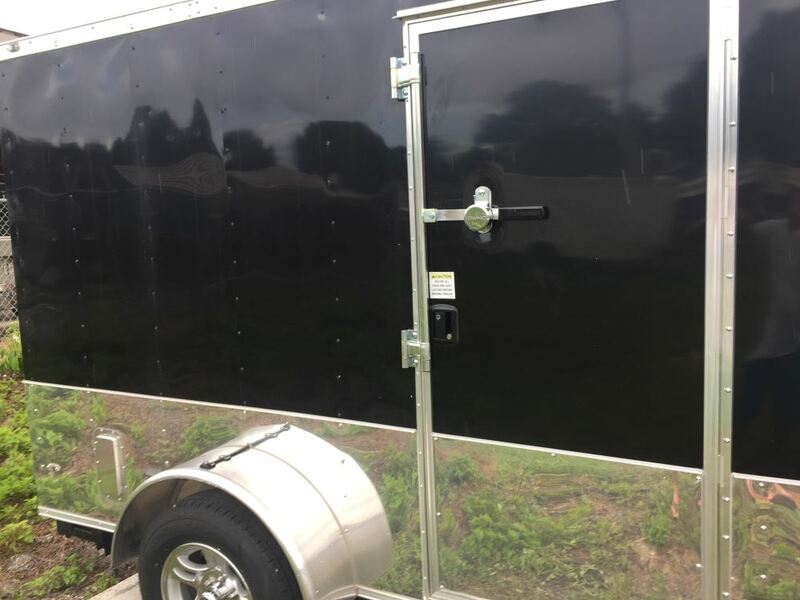 Since you are looking for a cam door lock that is 45-1/2 inches in length your best option would be to get the Universal Cam-Door Lock for Enclosed Trailers # 383200. With this kit you will be able to select the exact length of pipe to use from your local hardware store so that you get the exact length of door handle you need. You will need to use a 3/4 inner diameter pipe. We have all sorts of door and vent parts for all types of trailers. 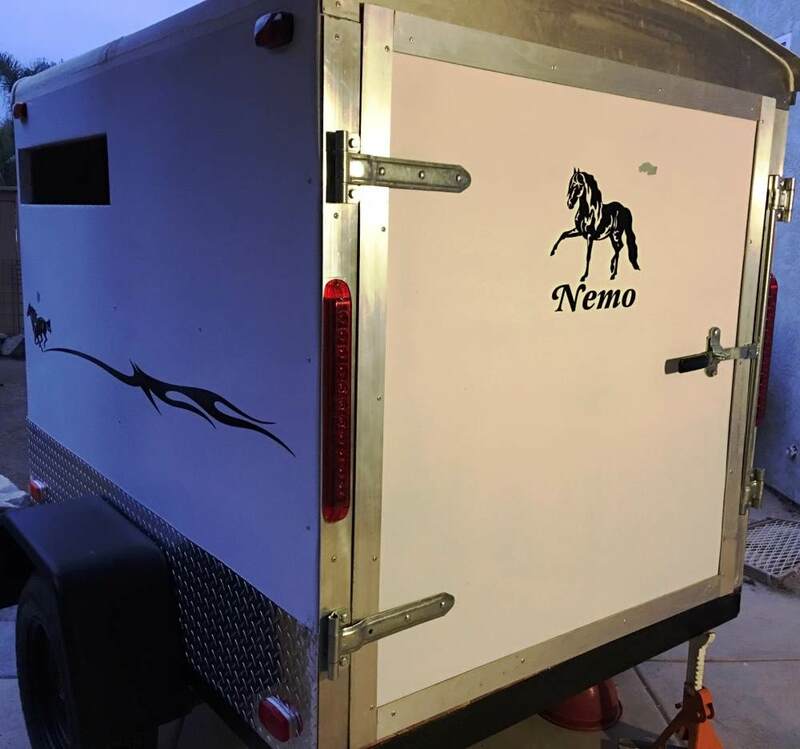 And we can help you find items specific for horse trailers too; just click on the link provided to see all categories of items for horse trailers. Next click on the heading Door Latches, first image on the second row, to see just those items, such as flush latch # PLR5115 and # L3980. We also have Side-Door Bar Lock Assembly locks like # 305736. The Lock Side-Door Bar Lock Assembly, # 305736, is designed so that when it is installed, it pushes the door tightly closed. The unit is not adjustable. Attempting to bend or heat the components could compromise the structural integrity of the unit. The only grip/cover we have is the Replacement Rubber Handle Grip for Cam Door Lock Handle # FVH200. This is 3 inches long by 2 inches wide and 1/4 inch tall. I've attached a photo to assist. 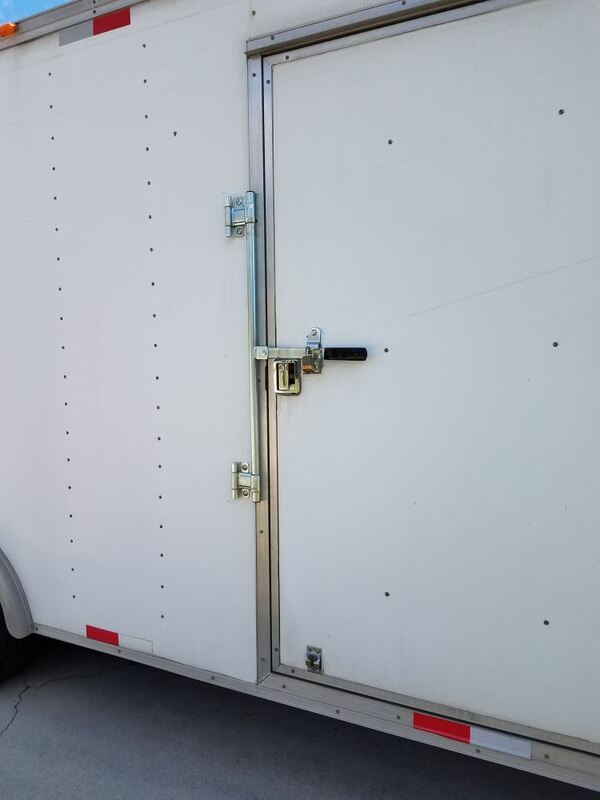 You would need to use the Universal Cam-Door Lock for Enclosed Trailers, item # 383200, to create a bar lock assembly of 55 inches. With this item you supply the 3/4 inch inside diameter pipe to make a custom door lock. Some welding is required for installation of this kit. 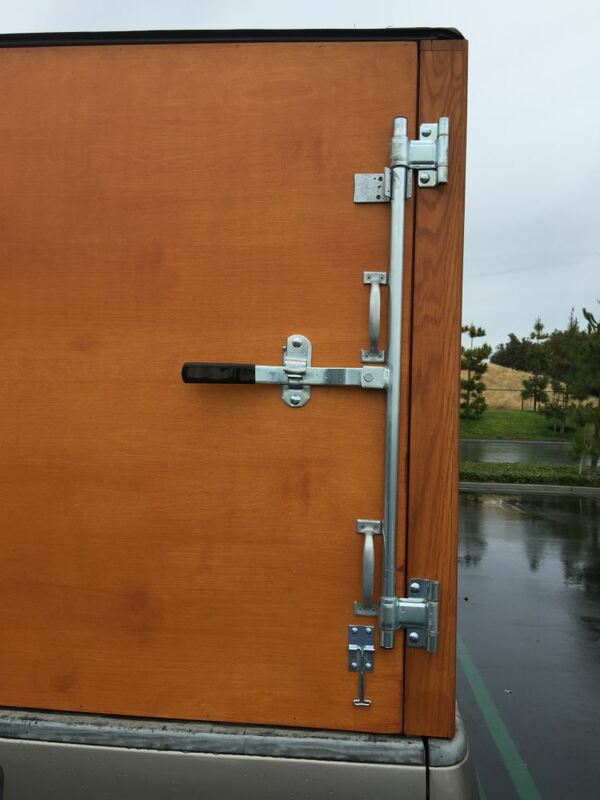 Due to shipping restraints we do not have a Side-Door Bar Lock Assembly longer than 36 inches at this time. 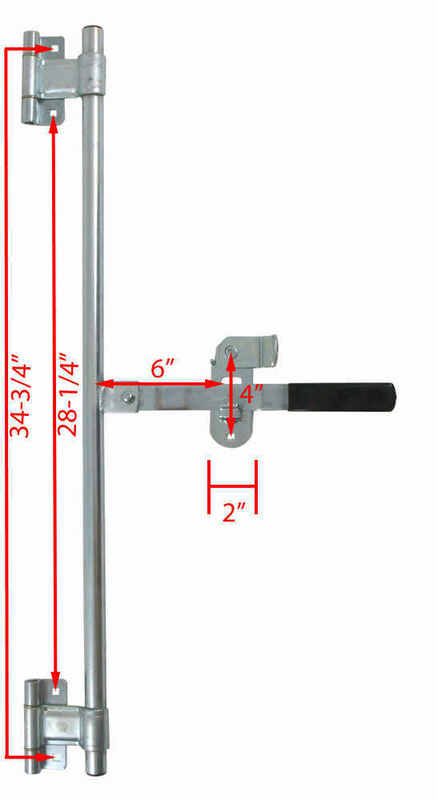 The Redline 36 Inch Side-Door Bar Lock Assembly, # 305736, can be used on the right and left side. The image on our product page shows it in the left hand orientation, but it can be used on the right hand side by flipping it upside down. Check out the photo that I attached. First, the Universal Cam-Door Lock, # 383200, does not come with the pipe. You will need to provide a 3/4 inch diameter pipe. I would use regular steel because it is easier to weld then galvanized materials. The handle gets welded to the pipe but none of the other parts. I have linked a video review for you. If you want something similar that includes the pipe you can use # 305736.